In this study, we show that Δ-9-tetrahydrocannabinol (THC), the major psychoactive component of marijuana, suppresses host immune reactivity against lung cancer. In two different weakly immunogenic murine lung cancer models, intermittent administration of THC (5 mg/kg, four times/wk i.p. for 4 wk) led to accelerated growth of tumor implants compared with treatment with diluent alone. In contrast to our findings in immunocompetent mice, THC did not affect tumor growth in tumor-bearing SCID mice. The immune inhibitory cytokines, IL-10 and TGF-β, were augmented, while IFN-γ was down-regulated at both the tumor site and in the spleens of THC-treated mice. Administration of either anti-IL-10- or anti-TGF-β-neutralizing Abs prevented the THC-induced enhancement in tumor growth. Both APC and T cells from THC-treated mice showed limited capacities to generate alloreactivity. Furthermore, lymphocytes from THC-treated mice transferred the effect to normal mice, resulting in accelerated tumor growth similar to that seen in the THC-treated mice. THC decreased tumor immunogenicity, as indicated by the limited capacity for tumor-immunized, THC-treated mice to withstand tumor rechallenge. In vivo administration of a specific antagonist of the CB2 cannabinoid receptor also blocked the effects of THC. Our findings suggest the THC promotes tumor growth by inhibiting antitumor immunity by a CB2 receptor-mediated, cytokine-dependent pathway. Marijuana smoke produces its psychotropic effects by delivering milligram quantities of cannabinoids, including primarily Δ-9-tetrahydrocannabinol (THC),3 to the lung (1). In addition to its effects on the CNS, THC is an immune modulator, with in vitro and in vivo studies indicating immunosuppressive effects on macrophages (2, 3, 4, 5), NK cells (6, 7), and T lymphocytes (8, 9, 10, 11). The recent documentation of specific cannabinoid receptor expression by leukocytes has generated increased interest in the immunomodulatory effects of THC (7, 12). In this study, a murine model was used to examine the effects of THC on the immune response to lung cancer. Cytokines serve as critical regulators of cell-mediated immunity, both enhancing and limiting immune responses (13). T cells secreting type 2 cytokines, including IL-10, inhibit cell-mediated immunity and antitumor responses (13, 14). In contrast, T cells producing primarily type 1 cytokines, including IL-2 and IFN-γ, are potent activators of cell-mediated immunity (15). Several factors appear to modulate the production of cytokines toward one cytokine profile or the other (13). Regulation of cytokine production profiles allows for a controlled balance between stimulation and suppression of cell-mediated responses. THC may exert its immunosuppressive effects through disruption of these homeostatic mechanisms by inhibiting the ability of lymphocytes to produce type 1 cytokines and promoting type 2 cytokine production (16). The THC-mediated modulation of immune reactivity has previously been studied in infectious disease models (17). Newton and associates (16) injected mice with THC before infecting them with a sublethal dose of an opportunistic lung infection, Legionella pneumophila. While control mice developed cell-mediated immune responses and became immune to repeated infection, mice pretreated with THC failed to react and died when rechallenged. In addition to controlling infectious diseases, host immunity has been recognized to play an important role in limiting tumor growth (18). However, tumor cells may inhibit the effectiveness of antitumor immunity through a variety of mechanisms (19, 20, 21, 22, 23). Tumor cells induce an imbalance in cytokine production, leading to the predominant elaboration of cytokines that limit cell-mediated immunity (24). We hypothesized that THC would exaggerate this immunosuppressive network by augmenting production of these immunosuppressive cytokines. In this study, we report for the first time that THC promotes tumorigenicity and limits immunogenicity in vivo by up-regulating the potent immune inhibitory cytokines, IL-10 and TGF-β. These effects are mediated by a CB2 receptor-dependent pathway. THC was obtained as a solution of 50 mg/ml in absolute ethanol from the National Institute of Drug Abuse (NIDA) of the National Institutes of Health. Recombinant cytokines IL-10, IFN-γ, and TGF-β, as well as the corresponding Abs for these cytokines used in ELISA, were purchased from R&D Systems (Minneapolis, MN) and PharMingen (San Diego, CA). SR144528 was generously provided by Murielle Rinaldi-Carmona (Sanofi Recherche, Montpellier, France). Staphylococcal enterotoxin B (SEB) was purchased from Sigma (St. Louis, MO). Pathogen-free male C57BL/6 (H-2b) and BALB/c mice (H-2d) (8–12 wk of age) were obtained from Harlan (Indianapolis, IN) or Simenson Laboratories (Gilroy, CA). Mice were maintained in the West Los Angeles Healthcare Center Animal Research Facility. BALB/c SCID mice obtained from the UCLA core facilities and maintained in cages housed in laminar flow hoods under pathogen-free conditions. All studies received approval by the institutional animal review committee. The murine Lewis lung carcinoma (3LL, H-2b) and line 1 alveolar cell carcinoma (L1C2, H-2d) cell lines were used to establish the in vivo models. Both tumors are well-characterized lines that are weakly immunogenic and evidence progressive tumor growth in vivo (25, 26). The cells were cultured in complete medium consisting of RPMI (Irvine Scientific, Santa Ana, CA) supplemented with 10% FCS (Gemini Bioproducts, Calabasas, CA) and antibiotics (penicillin, streptomycin; Gemini Bioproducts) and kept at 37°C in a humidified atmosphere containing 5% CO2. To determine the effect of THC on tumorigenicity in vivo, mice were pretreated for 2 wk with i.p. injections of THC (5–40 mg/kg) or diluent control (0.2% ETOH in saline) four times per week. Fourteen days following the initiation of THC or diluent injections, 5 × 105 3LL cells or 105 L1C2 cells were implanted s.c. in the suprascapular area. Following implantation of tumor cells, mice continued to receive THC injections four times per week. Tumor growth was assessed three times each week following tumor implantation. Two bisecting diameters of each tumor were measured with calipers, and the volume was calculated using the formula 0.4 × ab2, in which a represents the larger diameter and b the smaller diameter. To determine the effect of THC on cytokine production in tumor-bearing mice, nonnecrotic tumors and spleens were isolated from the 3LL tumor-bearing mice. Mice were treated with THC or diluent control using the dosing and injection schedule, as described above. TGF-β, IL-10, and IFN-γ levels were evaluated in tumor homogenates and 3-day splenocyte culture supernatants by cytokine-specific ELISA, as previously described (27). Briefly, 96-well plates (Costar, Cambridge, MA) were coated overnight with 2 μg/ml of specific rat or mouse anti-cytokine-specific capture mAb. The wells of the plate were blocked with 10% FBS or equine serum in PBS, followed by washing with PBS/Tween 20. The plate was incubated with Ag for 1 h, and excess Ag was washed off with PBS/Tween 20. Then the plate was incubated with 1 μg/ml of biotinylated mAb specific for IL-10, TGF-β, or IFN-γ for 30 min, and excess Ab was washed off with PBS/Tween 20. Finally, the plate was incubated with avidin peroxidase, and following incubation in OPD substrate, the subsequent change in color was read with a Dynatech MR5000 spectrophotometer (Chantilly, VA). To measure TGF-β concentrations, the supernatants were first acidified for 25 min at room temperature in 50 mM HCl and then neutralized with 50% vol of 5 M NaOH + 50% vol of 1 M HEPES. The sensitivity limits of the IL-10, TGF-β, and IFN-γ ELISAs were 36, 36, and 15 pg/ml, respectively. Two weeks after initiation of i.p. THC or diluent control injections (four times per week), BALB/c mice were injected i.v. via a lateral tail vein with SEB (50 μg) or normal saline control. Two hours later, the sera were assayed for IL-2 and IFN-γ production by cytokine-specific ELISA. To identify the in vivo immunoregulatory role of IL-10 and TGF-β following THC administration, Ab-blocking studies were performed as follows: C57BL/6 mice were pretreated with THC or diluent control, as described above, for 2 wk and then injected with 5 × 105 3LL cells s.c. Anti-IL-10 Ab JES-2A5 (5 mg/kg) or control Ab GL 113-5E (see Fig. 3⇓A) or anti-TGF-β Ab 1D11.16.8 (5 mg/kg) or control Ab anti-Mopx, murine IgG (Fig. 3⇓B) was administrated i.p. 1 day before tumor inoculation. Mice were then given additional THC or diluent control four times per week until the completion of the experiment. Anti-IL-10, anti-TGF-β, or control Ab was administered three times per week until the completion of the experiment. Tumor volumes were monitored three times per week. Mice received THC or diluent control injections for 2 wk before APC or T cell isolation. APC were purified from splenocytes by depleting B cells with TIB-146, CD4 cells with TIB-207, and CD8 cells with TIB-150. T cells were purified from splenocytes by depleting B cells with TIB-146 only. All depleting Abs were obtained from the American Type Culture Collection (Manassas, VA). A total of 4 × 105 T cells and varying numbers of APC (corresponding to APC:T cell ratios of 1:64 to 1:4) were plated in quadruplicate in 96-well round-bottom microtiter plates with 200 μl complete medium per well. These were incubated at 37°C for 6 days and then pulsed with 1 μCi/well [3H]thymidine (Amersham, Arlington Heights, IL) for 24 h. The uptake of thymidine was determined by harvesting the cells onto filter mats using a Skatron Cell Harvester (Sterling, VA). The disks were air dried, placed in scintillation vials with 1 ml of scintillation fluid, and counted in a Beckman scintillation counter (Fullerton, CA). Data are presented as the average cpm of the quadruplicate wells. Following pretreatment with THC (5 mg/kg) or diluent control (0.2% ETOH in saline), 4 days per week for 2 wk, BALB/c mice were immunized with 5 × 106 irradiated (1000 rad) L1C2 cells by s.c. injection in the left suprascapular area once each week for 6 wk. Four weeks after the final immunization, mice were rechallenged with 1–3 × 105 L1C2 cells by s.c. inoculation on the right flank. Mice were observed for tumor growth for 40 days after rechallenge. Lymphocytes were isolated from spleens of THC or diluent-treated BALB/c mice for 2 wk by Dynal beads using the manufacturer’s protocol (Dynal, Great Neck, NY). A total of 5 × 107 lymphocytes/injection were transferred to normal mice by a lateral tail vein injection 1 day before and 7 days following inoculation of 105 L1C2 tumor cells. Tumor volumes were assessed three times per week. To determine whether the THC effect on tumorigenicity in vivo is mediated through the CB2 cannabinoid receptor, SR144528, a selective antagonist of the CB2 receptor (28), was used in the following experiments. BALB/c mice were pretreated for 2 wk with i.p. injections of THC (5 mg/kg), diluent control, or THC plus administration of SR144528 (0.7 mg/kg) by gavage four times per week. A total of 105 L1C2 cells were then implanted s.c., and mice continued to be treated with THC, diluent control, and/or SR144528 four times per week throughout the remainder of the experiment. Tumor volumes were monitored three times per week. Each treatment group included at least six mice. Student’s t test for unpaired data was used to compare means of two groups. For simultaneous comparisons of means from more than two groups, one-way ANOVA was used. When significant differences in group means were found, Tukey’s Studentized Range Test was used to perform pairwise comparisons between the means. For categorical data from the immunization experiments, Fisher’s Exact Test was used to compare the proportion of animals rejecting the tumor. Statistical analyses were performed using SAS/PC software (29). Differences were considered statistically significant for p values <0.05. To understand how THC may alter the immune response to cancer, we evaluated the effect of THC on tumorigenicity in vivo. Lewis lung carcinoma (3LL) and line 1 alveolar carcinoma (L1C2) tumor cells were inoculated s.c. in THC- or diluent-treated C57BL/6 and BALB/c mice, respectively. As shown in Fig. 1⇓, A and B, there was significant enhancement of 3LL and L1C2 tumor growth in THC-treated mice. In preliminary studies, we performed a THC dose-response evaluation (5–40 mg/kg/injection). Because dosage of THC >5 mg/kg/injection showed the same degree of tumor growth enhancement as 5 mg/kg, we used this dose for all subsequent studies. Based on previous studies demonstrating THC-mediated suppression of cell-mediated immunity (11), we speculated that THC was enhancing tumor growth by inhibiting host antitumor immunity. To evaluate this hypothesis, we assessed L1C2 tumor growth in immunodeficient SCID mice treated with THC or diluent alone. As shown in Fig. 1⇓C, THC did not alter tumor growth in SCID mice. These findings suggested that THC caused suppression of antitumor responses by enhancing the activity of host immunosuppressive networks in vivo. THC promotes tumorigenicity in immunocompetent mice, but has no effect on tumor growth in immunodeficient mice. A, THC promotes 3LL tumor growth in vivo. C57BL/6 mice were pretreated for 2 wk with i.p. injections of THC (5 mg/kg) (•) or diluent control (○) four times per week. A total of 5 × 105 3LL cells were then implanted s.c., and mice continued to be treated with THC or diluent control four times per week throughout the remainder of the experiment. The tumor volumes were monitored three times per week. n = 11 mice per group. B, THC promotes L1C2 tumor growth in vivo. BALB/c mice were grouped and treated in the same manner as the C57BL/6 mice above. A total of 105 L1C2 cells were implanted s.c. THC administration (•) led to enhanced tumorigenicity of L1C2 compared with diluent control-treated mice (○). n = 11 mice per group. C, THC does not affect L1C2 tumorigenicity in BALB/c SCID mice. BALB/c SCID mice were grouped and treated in the same manner as the immunocompetent mice above. A total of 105 L1C2 cells were inoculated s.c., and tumor volumes were monitored. No significant difference in tumor growth was observed when comparing THC (•) and diluent-treated control (○) groups (n = 5 mice per group). Based on the above results and previous reports demonstrating that tumor progression may be modified by host cytokine profiles (14, 21, 30), we speculated that THC may mediate its effects by generating an imbalance in host cytokine production. Nonnecrotic tumors and spleens were isolated from 3LL tumor-bearing C57BL/6 mice and evaluated for IL-10, TGF-β, and IFN-γ production in tumor homogenates and splenocyte culture supernatants. As shown in Table I⇓, tumor homogenates from THC-treated mice produced significantly more IL-10 and TGF-β, but less IFN-γ than did diluent-treated controls. Similarly, splenocyte supernatants from THC-treated mice contained significantly more IL-10 and TGF-β, but less IFN-γ than did diluent-treated controls (Table I⇓). To further assess the capacity for THC-treated mice to generate type 1 cytokine responses, we evaluated the potent stimulus generated by the in vivo administration of SEB. Superantigens including SEB have been found to polyclonally activate T cells in vivo, leading to generation of cytokines, including IL-2 and IFN-γ (31). In contrast, tolerance to superantigen-induced cytokine production is mediated by IL-10 and TGF-β (32). As shown in Table II⇓, the amount of IL-2 and IFN-γ produced in response to SEB was significantly reduced in THC-treated mice compared with diluent-treated controls (p < 0.05). Thus, THC administration leads to an increased immunosuppressive cytokine profile (enhanced IL-10 and TGF-β production) and inhibits Th1 cytokine (IL-2 and IFN-γ) release. IL-10 and TGF-β have been found to potently inhibit host immunity (30, 33) and may act at several points to interfere with either the generation or maintenance of antitumor immune responses. IL-10 has the capacity to inhibit macrophage cytokine production (34), Ag presentation (35), Ag-specific T cell proliferation, and type 1 cytokine production (36, 37). TGF-β is another powerful immunosuppressive cytokine, which may limit tumor regression via several different pathways. TGF-β antagonizes CTL generation (38) and macrophage activities (39, 40). The production of TGF-β by tumors has been documented as a mechanism of tumor-induced tolerance (41, 42). Based on the previously documented detrimental effects of IL-10 and TGF-β, we speculated that the THC-mediated induction of IL-10 and TGF-β could be responsible for enhanced tumor growth in mice receiving THC. To determine the contribution of the heightened IL-10 and TGF-β production in THC-treated mice (Table I⇑), anti-IL-10 mAb or anti-TGF-β mAb was administered to mice receiving THC. Anti-IL-10 mAb or anti-TGF-β mAb, but not control Ab, prevented the THC-induced increase in tumor growth (Fig. 2⇓, A and B). Administration of anti-IL-10 or anti-TGF-β mAb reverses the THC-mediated increase in tumor growth in vivo. C57BL/6 mice were pretreated with 5 mg/kg of THC or diluent control (0.2% ETOH) for 2 wk before s.c. inoculation of 5 × 105 3LL cells. After tumor inoculation, mice received THC or diluent control four times per week until sacrifice. A, THC or diluent control-treated mice received anti-IL-10 or control Ab three times per week, beginning 1 day before tumor inoculation until mice were sacrificed. n = 5 mice per group. B, THC or diluent control-treated mice received anti-TGF-β or control Ab three times per week, beginning 1 day before tumor inoculation until mice were sacrificed (n = 5 mice per group). An important in vitro correlate of graft or tumor rejection, the MLR is able to discriminate lymphocyte activation that occurs as a function of disparate MHC expression. IL-10 has been previously documented to decrease MLR reactivity (43). Based on the enhanced local and systemic overproduction of IL-10 in the THC-treated mice, we speculated that both APC and T cells from these mice would have impaired MLR responses. Following administration of THC or diluent to BALB/c mice for 2 wk, splenic APC and T cells were isolated and evaluated in separate MLRs with T cells or APC, respectively, from C57BL/6 mice. As shown in Fig. 3⇓A, APC from THC-treated mice generated an alloreactive proliferative response that was significantly lower than the MLR generated with APC from diluent-treated controls. Similarly, when lymphocytes from THC-treated mice were utilized as responder cells, a diminished alloreactive proliferative capacity was demonstrated (Fig. 3⇓B). These findings suggest that THC limits both APC and T cell responses. THC inhibits APC and T cell alloreactive function. Following administration of THC (5 mg/kg) or diluent control (four i.p. injections per week for 2 wk), splenic APC and T cells were isolated. A, APC from the THC-treated BALB/c mice show diminished capacity to stimulate normal responder C57BL/6 T cells. B, Responder T cells from THC-treated BALB/c mice show diminished alloreactive capacity in response to APC from normal C57BL/6 mice. L1C2 is a weakly immunogenic tumor. Normal mice can be immunized against this tumor by repeated s.c. administration of irradiated tumor cells. To determine whether THC diminished tumor immunogenicity, we assessed the capacity of THC-treated mice to withstand tumor challenge following six weekly immunizations with irradiated tumor. Four weeks following completion of the immunizations, mice were challenged with live tumor cells (1–3 × 105) by s.c. injection. Although all diluent-treated mice were able to withstand all doses of tumor challenge following immunization, the THC-treated groups showed a significant reduction in the numbers of mice surviving rechallenge at the highest dose of live tumor cells (p = 0.038) (Table III⇓). Because it appeared that THC mediated its immunosuppressive effects by up-regulating production of inhibitory cytokines from immune cells, we assessed the capacity of lymphocytes from THC-treated mice to transfer the immune deficit to normal controls. Fifty million splenic lymphocytes from THC-treated mice were transferred to normal mice by i.v. tail vein injection 1 day before and 7 days following s.c. inoculation of 105 L1C2 tumor cells. 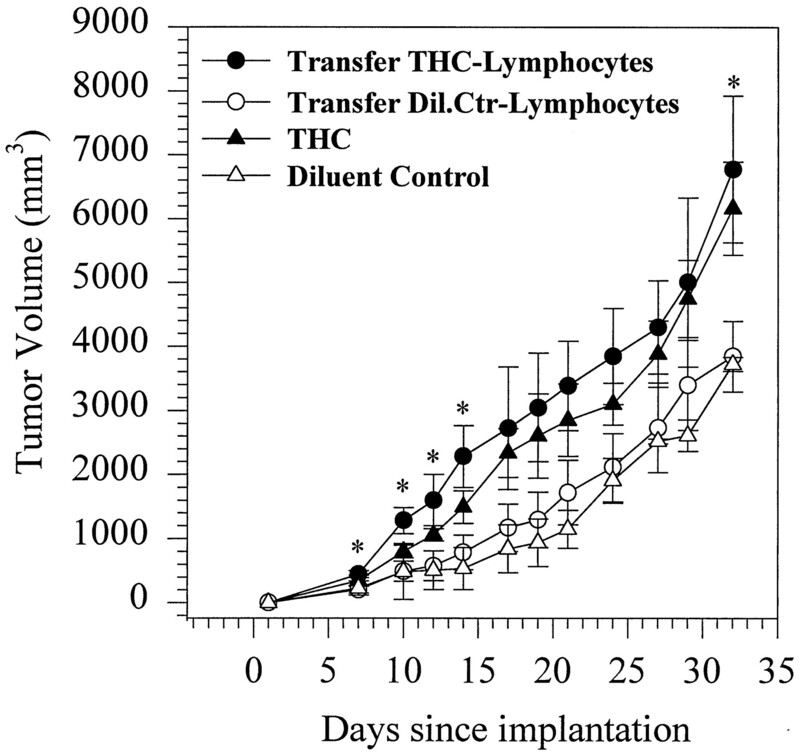 Following transfer of lymphocytes from THC-treated mice to normal controls, the L1C2 tumor growth was augmented, revealing a similar pattern to that demonstrated in THC-treated mice (Fig. 4⇓). In contrast, transfer of lymphocytes from diluent-treated control mice to normal controls did not alter tumor growth. Transfer of lymphocytes from THC-treated mice augments L1C2 tumorigenicity in normal mice. BALB/c mice were pretreated for 2 wk with i.p. injections of THC (5 mg/kg) or diluent control. Splenic lymphocytes were isolated from the THC-pretreated mice and purified by Dynal beads. A total of 5 × 107 lymphocytes were transferred via a lateral tail vein to normal BALB/c mice 1 day before and 7 days following s.c. inoculation of L1C2 tumor cells (105) (n = 7 mice per group). Based on previous studies, we speculated that the THC-mediated modification of antitumor activity was CB2 receptor dependent (5, 44, 45). To determine the role of the CB2 receptor, we assessed tumor growth in mice treated with THC in combination with SR144528, a specific CB2 receptor antagonist. The tumor growth curves in Fig. 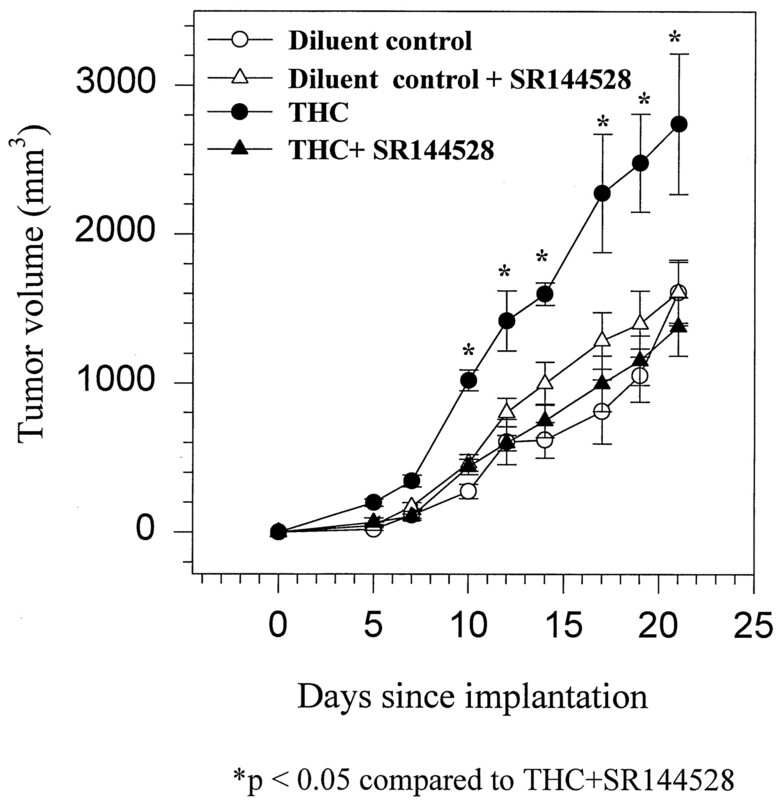 5⇓ show that the THC-mediated enhancement in tumor growth is ablated by treatment with SR144528. SR144528, an antagonist of the CB2 cannabinoid receptor, blocks the THC-mediated increase in tumor growth in vivo. BALB/c mice were pretreated for 2 wk with i.p. injections of THC (5 mg/kg) (•), diluent control (○), or the same dose of THC (▴) and diluent control (▵) plus oral administration of SR144528 (0.7 mg/kg) four times per week. A total of 105 L1C2 cells were then implanted s.c., and mice continued to be treated with the same regimen of THC, diluent control, THC plus SR144528, or diluent control plus SR144528 four times per week throughout the remainder of the experiment. Tumor volumes were monitored three times per week (n = 6 mice per group). In the current study, we found that THC promoted tumorigenicity in two murine lung cancer models. This effect was dependent upon the production of immunosuppressive cytokines and was not detected in immunodeficient SCID mice, strongly suggesting that THC produced an immunosuppressive state that promoted enhanced tumor growth. Our results contrast with the recent study by Gave-Roperh et al. (46), who evaluated intratumoral injection of THC for its effects on the growth of intracranial glioma cells. These authors found that intratumoral administration of THC led to apoptosis and a reduction, not enhancement, in tumor growth. However, Gave-Roperh et al. used an immunodeficient mouse model, a system that obviates the immunosuppressive effects of THC. They also administered THC directly into the tumor at total body doses 5–20-fold greater than those used in our study, most likely resulting in intratumoral THC concentrations dramatically higher than tested in our model. Finally, tumors vary widely in their susceptibility to apoptosis. These differences make it difficult to directly compare our results with those reported by Gave-Roperh et al. Further studies will be necessary to fully understand the differences in these models. Cannabinoids, including THC, have been well recognized as modulators of host immunity (47), with most studies indicating that THC is immunosuppressive (48). Previous studies have indicated that THC can compromise the immune response and limit resistance to both bacterial and viral infections (47, 49, 50, 51, 52, 53, 54). Consistent with the THC-induced decrement in immune responses against infectious diseases, we report in this work that THC can potently suppress the antitumor immune response, leading to enhanced tumor growth in vivo. The capacity for effector cells to generate cytokines is a critical element in the generation of effective immunity. We hypothesized that THC enhanced tumor growth in this lung cancer model by augmenting immune suppressive cytokines. Although the tumor-bearing state is accompanied by up-regulation of immune suppressive cytokines (55, 56), we speculated that THC could further augment the production of cytokines deleterious to antitumor responses. The host immune response against tumors has been documented to be down-regulated by soluble mediators in the tumor environment (24). Tumors may either directly release factors or orchestrate immune suppressive networks by inducing host immune cell production of inhibitory cytokines. IL-10 and TGF-β are two important immune inhibitory cytokines produced or induced by tumors, causing limitations in immune reactivity against the tumor (24, 57, 58). We found that THC increased the release of IL-10 and TGF-β in vivo both at the tumor site and in the spleen (Table I⇑), suggesting that THC exaggerated tumor-induced immune suppression by regulating cytokine production. The THC-mediated up-regulation of IL-10 and subsequent decrease in antitumor immunity are consistent with the previously described activities of this cytokine. IL-10 has the capacity to inhibit antitumor responses through several pathways. IL-10 has been documented to limit type 1 cytokine production, Ag presentation, and Ag-specific T cell proliferation (35, 36, 37). Pretreatment of tumors with IL-10 renders the tumor cells more resistant to CTL-mediated lysis (59, 60). The access of functional APC to the tumor site may also be limited by IL-10 production within the tumor environment (61). Previously, we found that production of IL-10 by cutaneous carcinomas provides a mechanism for evasion of the local T cell immune response (21). We also found that transgenic mice overexpressing IL-10 under the control of the IL-2 promoter were unable to limit the growth of immunogenic tumors (14). These earlier findings support the suggestion that enhanced lymphocyte-derived IL-10 production antagonizes antitumor immunity (30). In the present study, we show that THC-induced IL-10 production may be instrumental in mediating the reduction in alloreactivity (Fig. 3⇑, A and B) (43), the decline in type 1 cytokine production in response to superantigen (Table II⇑) (32, 62), and the limited capacity to generate specific antitumor immunity (Table III⇑) (14, 30). The capacity of THC to induce a type 2 cytokine response, while limiting type 1 cytokine production, is consistent with the findings of Newton et al. (16). These investigators noted that THC promoted a decrement in murine splenocyte IFN-γ production, but enhanced IL-4 secretion. Superantigens, including SEB, have been demonstrated to bind APC MHC class II molecules and stimulate a large population of CD4+ and CD8+ lymphocytes through interactions with specific TCR Vβ phenotypes (63). As a result of these interactions, IL-2 and IFN-γ are potently induced. THC administration has been noted to be associated with a marked limitation of type 1 cytokine production (16). In the present study, we find that the THC-mediated inhibition of type 1 cytokine production in vivo persists despite the administration of SEB, one of the most potent and consistent stimuli for type 1 cytokine production (63). Thus, the THC-induced decrement in type 1 cytokine production is both profound and apparently irreversible. Our findings of reduced IL-2 and IFN- γ release in THC-treated mice in response to SEB are consistent with the results of Florquin et al. (64) and Bean et al. (65). The latter studies demonstrated that IL-10 limits the lethal effects of SEB challenge in vivo. Thus, the readily induced, augmented levels of IL-10 produced by lymphocytes in THC-treated mice may directly limit capacity for IL-2 and IFN-γ production. Relevant to our current findings, previous studies have also indicated that TGF-β may limit superantigen-induced type 1 cytokine production (32, 66). Previous studies suggest that populations of T cells in the tumor-bearing host may develop suppressor activities through the induction of IL-10 gene expression (30, 67). In accordance with these studies documenting the importance of lymphocyte-derived IL-10 in the generation of tumor-induced tolerance, we speculated that THC might act to enhance tumor growth by promoting the induction of lymphocyte IL-10 in vivo. The fact that i.v. injection of lymphocytes from THC-treated mice had the capacity to transfer the immune deficit that led to enhanced tumor growth in normal controls (Fig. 4⇑) strongly supports this hypothesis. Furthermore, administration of neutralizing mAb anti-IL-10 led to resolution of the tumor growth-promoting effects of THC (Fig. 2⇑A). These results are consistent with those of Klein et al. (68), who found that THC had the capacity to both limit lymphocyte production of IFN-γ and promote the release of IL-4 and IL-10. Our findings are also consistent with those of Groux et al. (69), who found that IL-10 itself drives the generation of T cells that have the capacity to overproduce IL-10 and potently suppress Ag-specific immune responses in vivo. This T lymphocyte subset has been termed T regulatory cells 1 or Tr 1 (69). Further studies will be necessary to determine whether THC induces this specific phenotype. In addition to IL-10, TGF-β also was elevated both at the tumor site and systemically in THC-treated mice. This cytokine has been found to limit lymphocyte proliferation, activation, and cytolytic function (70). TGF-β may inhibit APC accessory signals, including cytokine production and CD40 expression (71). Furthermore, TGF-β may promote Th2 differentiation and thus lead to enhanced lymphocyte IL-10 production (56, 72). In our studies, we find that administration of anti-TGF-β mAb prevents enhancement of tumor growth by THC (Fig. 2⇑B). Our observations suggest that while both IL-10 and TGF-β play significant roles in mediating the THC-induced suppression of antitumor immunity, abrogation of either cytokine alone is sufficient to reverse the detrimental effects of THC. These findings are also consistent with the possibility that TGF-β is responsible for inducing IL-10 in vivo (56, 73). The induction of alloreactivity is an important parameter that serves to predict tumor or allograft rejection. THC has been shown to limit the functional activities of both lymphocytes and APC (74, 75). In the present study, we find that both T cells and APC from THC-treated mice show diminished alloreactivity (Fig. 3⇑, A and B). These findings suggest that both APC and lymphocyte effectors are the ultimate targets of the THC-induced decline in antitumor immunity. These findings are consistent with previous studies documenting THC-induced dysfunction in both cell types (2, 4, 10, 16). Definitions of the precise cellular and molecular phenotypic characteristics responsible for these THC-induced changes will require further investigation. Understanding of the potential pathways for cannabinoid-mediated immune modulation has been enhanced by discovery of receptors with high affinity for cannabinoids (12, 76). As first described by Matsuda, the CB1 receptor is found predominantly in the CNS (76) and is minimally present in immune cells (77, 78). In contrast, the CB2 receptor is expressed predominantly in immune cells (77). CB2 is a seven-transmembrane-structured G protein-coupled receptor that mediates cAMP-dependent and cAMP-independent signaling (68, 79, 80). Based on the known effects of cannabinoids on immune cells (7), we hypothesized that the THC-induced effects in this tumor model were CB2 mediated. In this study, we show that the THC promotion of tumor growth is abrogated when mice receive a specific CB2 receptor antagonist (Fig. 5⇑). Although the CB1 receptor is also expressed on immune cells (81), the possible role of the CB1 receptor in the responses in this model will require further investigation. The finding that THC inhibits antitumor immunity in a murine lung cancer model has potentially important clinical implications. THC is approved for use in combating chemotherapy-related emesis in patients with cancer (82), and smoked marijuana has been advocated for similar medical indications (83). A potential disadvantage in the medicinal use of THC or cannabis in patients with established cancer is the possible enhancement of tumor growth due to THC-mediated impairment in antitumor immune defenses. In addition, the tar phase of marijuana smoke, compared with that of tobacco, contains higher concentrations of procarcinogenic polycyclic hydrocarbons, including benz[α]pyrene (84), which has been shown to be a key factor promoting human lung cancer (85). Furthermore, four times as much tar is deposited in the respiratory tract from the smoke of marijuana than from that of a comparable amount of tobacco (86), thus amplifying respiratory exposure to the carcinogens in marijuana smoke. These observations suggest that regular use of marijuana may increase the risk of respiratory tract cancer, a possibility supported by several uncontrolled case series (87, 88, 89, 90) and by a recent case-control epidemiologic study (91). It is tempting to speculate, therefore, that impairment in antitumor defenses by THC, as suggested by the findings from this study, is an additional factor enhancing the carcinogenicity of smoked marijuana. 1 This work was supported by National Institutes of Health Grants R01 DA03018 (D.P.T.) and R01 CA71818 (S.M.D. ), the Department of Veterans Affairs Medical Research Merit Review Funds, and the Research Enhancement Award Program in Cancer Gene Medicine. 3 Abbreviations used in this paper: THC, Δ-9-tetrahydrocannabinol; ETOH, ethanol; SEB, staphylococcal enterotoxin B.
SAS Institute, I. 1990. SAS/Stat User’s Guide, Version 6, Vol. 1 and 2. Cary, NC. Donald, P.. 1991. Marijuana and upper aerodigestive tract malignancy in young patients. G. G. Nahas, and C. Latour, eds. Physiopathology of Illicit Drugs: Cannabis, Cocaine, Opiates. Advances in the Biosciences Pergamon Press, New York.